On this date, 90 years ago, at 8:55 pm, stranded radio-telegraphist Giuseppe Biagi sent off his hourly SOS. He used an Ondina 33, a radio that he managed to recover from the Airship ITALIA crash site on the Arctic pack and repair. At 9 pm, he at last made contact with the Royal Ship Città di Milano, which had been assigned by the Italian government as their support vessel. Five days prior, his SOS had been intercepted by a Russian amateur radio-specialist, and rescue missions from many countries were organized. Eventually, all the survivors were rescued on 12 July by the Russian icebreaker Krassin. The Ondina 33 radio was crucial for their rescue, as it was also used to direct rescuers from the sky, land and sea towards their constantly changing position on the drifting ice pack. 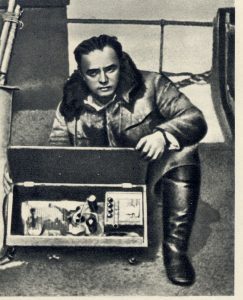 Giuseppe Biagi, radio-telegraphist of the ITALIA airship crew. In light of this anniversary, it is probably no coincidence that this week was chosen to celebrate the “Official Opening of the new Earth Observatory” in Ny-Ålesund, Svalbard – the very place from where the Airship ITALIA set off from in the early years of the 20th century. The New Earth Observatory is a twin radio-telescope that replaces the existing ones, with a 20m diameter parabolic antenna. This inauguration is part of the 10th IVS general meeting “Global geodesy and the role of VGOS – fundamental to sustainable development”. Polarquest2018 friend Vincenza Tornatore, PhD, is carrying out research in Geodesy and Geomatics at ‘Politecnico di Milano’ ((Technical University). Dr. Tornatore spoke at the conference, giving a presentation entitled “VGOS Wideband Reception and Emerging Competitor Occupations of VLBI Spectrum”. She gladly accepted to answer our questions about the strategic importance of radio-telescopes in the Arctic. PolarQuest: In 1928, a radio signal proved invaluable, as it determined the rescuing of nine crew members of the ITALIA Airship, the first airborne scientific laboratory of history. Today, you work with radio signals to study Quasars. What is a Quasar and how do you use radio to study them? Vincenza Tornatore: Quasars are interstellar objects in the center of a galaxy that typically shine brighter than a billion suns. Scientists suspect that they are driven by huge black holes that attract gases by their high gravitational effect. These are compressed and thereby heated to several million degrees. A quasar emits intense light and energy that travels a distance of more than a billion light-years. Therefore, when the signal arrives on the Earth, is very weak. Due the huge distance, they appear as fixed points from the Earth, and can serve as precise and stable fundamental points for the reference frame of radio astronomy – known as the International Celestial Reference Frame (ICRF). Radio astronomy measures the characteristics of radio waves emitted by physical processes that occur in space. Radio waves are much longer than light and, given the weakness of astronomical signals, large antennas, called radio telescopes, are needed. PQ: How does this use of radio signals compare to the work carried out on the Airship ITALIA? VT: Giuseppe Biagi used the Ondina 33 to create a signal for radio communication. In this case, the signal had a very precise frequency, with a frequency band defined by the modulation. It was a deterministic signal, completely defined for the whole duration with a sinusoidal trend. A radio source, on the other hand, is a random signal, emitted by various radiations, with different phases and frequencies, with an inconsistent random feature. The birth of radio astronomy is linked to the development and operation of radio communication. Guglielmo Marconi, in 1927, found interference in radio transmissions that coincided with the appearance of large sunspots and intense northern lights. PQ: The ITALIA adventure teaches us that the Arctic is not a friendly place to live and work, with harsh weather conditions and polar bears. 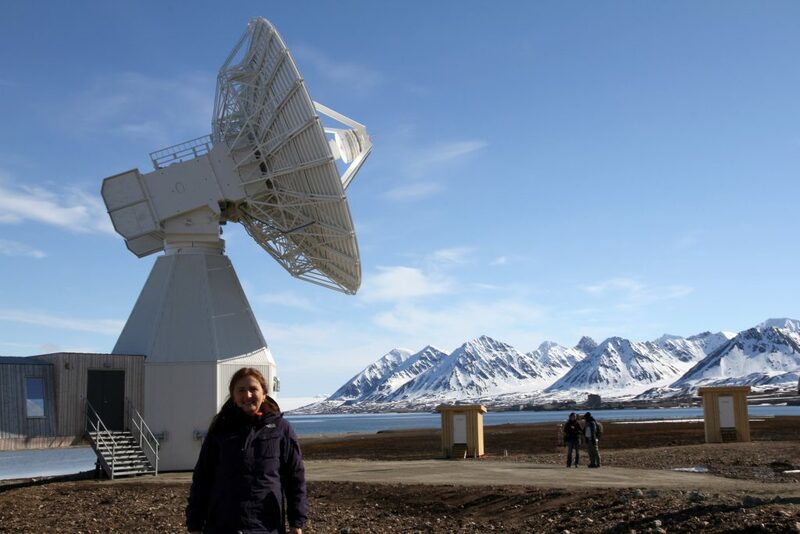 Why is Ny-Ålesund still such an important place for radio science? 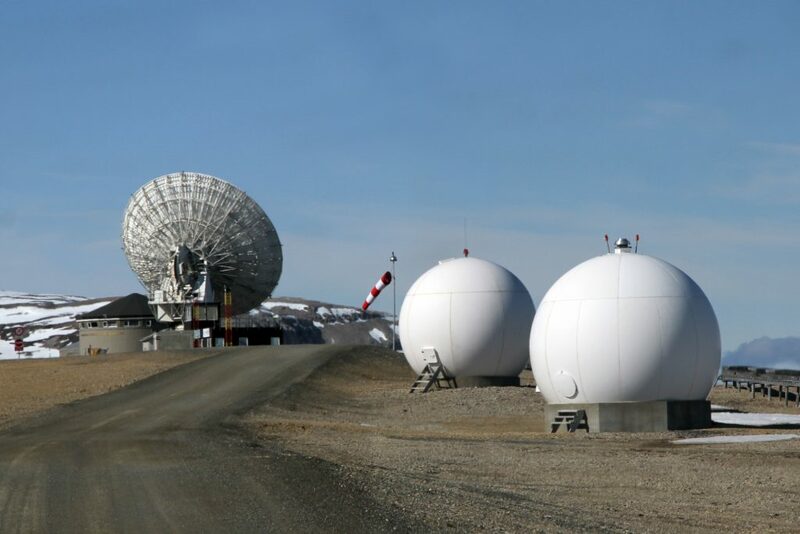 VT: Ny-Ålesund hosts two latest-generation VGOS radio telescopes. They represent a cornerstone of the global infrastructure to support more precise positioning and monitoring of today’s important issues, such as ice loss and sea-level change. These radio telescopes are a part of a global network of antennas operated and supported by an international collaboration of organizations hosted by NASA Goddard Space Flight Centre (GSFC). Their measurements are used as reference by many earth scientists studying crustal plate dynamics, the interior of the Earth and climate change – and even open opportunities to predict earthquakes and tsunamis. The importance of new VGOS infrastructures has been recognized by the United Nation in a resolution called “A Global Geodetic Reference Frame for Sustainable Development”, which was adopted by General Assembly in February 2015. This technology also plays in fact a vital role for satellite positioning techniques and space missions, since it is the only technique that can determine Universal Time. PQ: How important is technological innovation today in your field? VT: Technological innovations (hardware and software) play a major role for Geodesy since new measurement techniques can be developed to study and monitor global changes, for mapping, managing a big database of geospatial data, or for improving the measurement precision of existing methods. For example, the new VGOS system will allow results based on smaller (13.2 m instead of 20 m or 30m in diameter) fast slewing antennas and broadband receivers, higher recording data rate and transmission. PQ: What challenges are Arctic scientists facing today, compared to the first explorers of the Airship ITALIA? are the employment prospects in geodesy regarding the special region of the Arctic, in today’s context of global change, compared to 90 years ago when AIRSHIP ITALIA flew over the North Pole? VT: The primary challenge affecting the Arctic, and the research being carried out there, is climate change. It is a critical challenge for the Earth’s future, and the Arctic is the region of the planet where changes are occurring more rapidly than elsewhere. The melting of the ice pack and the Arctic glaciers will open new areas for exploitation by human beings. It is likely that in the coming decades there will be an intensification of many economic activities in the Arctic. With the withdrawal of the ice, fishing will be practiced further north; people will begin to exploit the reserves of oil and, above all, of gas present in the Arctic; tourism is already registering an expansion; it is also very likely that maritime traffic will increase, in parallel with the export of Arctic resources. Global warming has a huge impact on ice-covered surfaces, in particular on the formation and extension of sea ice, on the withdrawal of terrestrial glaciers and on the defrosting of permafrost. These phenomena have important consequences on the increase of vegetated surfaces and tundra, on the life of the animals and on the entire Arctic ecosystem. All this has consequences in economic, social and geopolitical terms that go well beyond the borders of this region. In other parts of the world the environmental challenge is the recovery of damaged ecosystems. In the Arctic there is still the possibility of defending an environment that, for the most part, is truly unique. The current system of governance in the Arctic is very fragmented. Although there are a large number of international agreements on the Arctic. Polarquest2018 goes into exploration mode… live on Italian national TV !